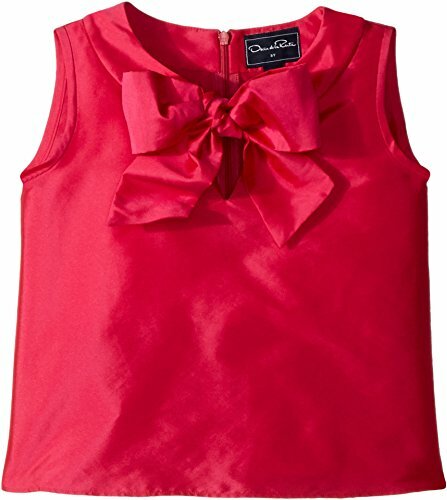 She'll be simple, yet chic, in the Oscar de la Renta Childrenswear Taffeta Sleeveless Bow Blouse. V-neck top with bow accent. Sparkly panel along neckline. Sleeveless. Straight hem. Back zip closure. 100% polyester. Machine wash cold, tumble dry low. Imported. This item may ship with an attached security tag. Merchandise returned without the original security tag attached or a damaged tag may not qualify for a refund. Measurements: Length: 15 in Product measurements were taken using size 5 (Little Kids). Please note that measurements may vary by size. She'll be simple, yet chic, in the Oscar de la Renta Childrenswear Taffeta Sleeveless Bow Blouse. V-neck top with bow accent. Straight hem. Back zip closure. 100% polyester. Machine wash cold, tumble dry low. Imported. This item may ship with an attached security tag. Merchandise returned without the original security tag attached or a damaged tag may not qualify for a refund. Measurements: Length: 15 in Product measurements were taken using size 5 (Little Kids). Please note that measurements may vary by size.